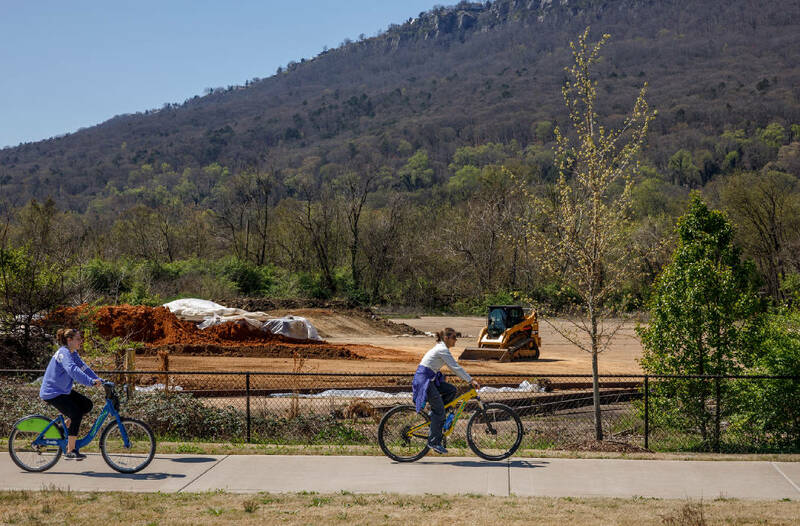 Cyclists ride past construction clearing way for an Alton Park connector trail from the Wheeland Foundry Trailhead of the Tennessee Riverwalk on Wednesday, March 27, 2019, in Chattanooga, Tenn. Officials are looking at ways to expand the riverwalk onto the North Shore, into St. Elmo and onto Lookout Mountain. Chattanooga's 25-mile paved trail system is expected to be fully connected by the end of the year, tying together decades of work that has led to a recreational trail that is widely used but has largely been disconnected from area residents. The central Tennessee Riverwalk — paid for with public funds, federal and local grants, and by local organizations — was conceptualized through a community-planning effort in the late 20th century that led to Ross's Landing, the Tennessee Aquarium and a reinvented downtown Chattanooga — birthing the 21st Century Waterfront and the concept of the "Chattanooga Way." Now, as two ongoing projects complete the central hub of the Tennessee Riverwalk and its adjoining trails, project leaders are shifting their focus to extending the trail system into neighborhoods to make it more accessible. Using water analogies for the nearby Tennessee River, leaders view the current system as the river itself while future projects will complete the tributaries flowing to surrounding areas. "That's part of the goal, longer term, is having this great spine. That word maybe doesn't do it justice, but thinking about this asset of this shared use path, we can start to think of the connections we can make to it," said Eric Asboe, Chattanooga's transportation administrative manager. The two ongoing projects — one to fully connect the South Chickamauga Creek Greenway and the other to extend the system into residential areas in St. Elmo — have long been in the public eye and are expected to be finished before the end of the year, according to city officials. The St. Elmo section will extend the trail from where it currently ends behind Crust Pizza on Broad Street. The additional 0.7 miles will connect to the Incline Railway and tie into the already completed Virginia Avenue Greenway. The South Chickamauga Creek trail currently sits in two, unconnected sections. The entire trail, when finished, will be 12 miles. Miles 0-4, extending from the riverwalk, and 7-12, out to East Ridge's Camp Jordan, are finished. The current project will connect miles 4-7 through a partnership between the city and the Trust for Public Land. The projects will finish what trail leaders have referred to as the system's core network and will also be the first sections connecting dense residential populations directly to the trail network. "Our priority at the Trust for Public Land is finishing out this core network for the greenway system," TPL Tennessee State Director Jenny Park said. "Those three miles at South Chick that we're partnering on that is going to fill a crucial gap in the system. It will create a pretty significant network for a city of Chattanooga's size." The land trust has partnered with the city to help finish and expand the existing system: purchasing land, building trail segments and lending advice. The Trust for Public Land and its partners have already begun the next step of the network: a tentatively-named Alton Park Greenway, which will connect to residents in Alton Park and Piney Woods. The nonprofit group purchased a rail corridor and donated it to the city, which is currently working to remove the rail bed and clear the path. The groups will now focus on the design phase of the 1.3-mile trail that will extend from the endpoint behind the Crust Pizza on Broad Street — creating a split-off with the new St. Elmo section of the riverwalk. The intersection will mirror that of South Chickamauga Creek Greenway, where travelers can remain on the riverwalk and go into St. Elmo or split off onto a separate trail heading toward Alton Park. "It's really important to change our perspective and understand that greenways aren't just a thing for wealthy folks in Spandex to enjoy on Sunday afternoons," Park said. "They're really a practical mechanism of economic mobility for many people." The new section will run along 33rd Street, heading east at first and then turning south. It will pass under Alton Park Boulevard and go out to Southside Community Park off Central Avenue. "This Alton Park connector is leading into a fairly dense community," Park said. "It's expanding mobility options for residents who have expressed over and over again they need more options." Community leaders are planning a vast network of connecting trails that lead to the central Tennessee Riverwalk. They envision a Chattanooga family riding safely to the Chickamauga Battlefield; a young professional traveling on paved trail outside their Red Bank apartment to meet with friends; a mother pushing a stroller from her Alton Park home; a student riding from East Ridge to classes at Chattanooga State Community College; a father commuting safely to his Southside job from Hixson. They foresee a trail that doesn't stop at the Tennessee River but continues across into Hixson, Red Bank and the North Shore. One that also stretches south through Chickamauga and other towns in North Georgia and back up to Camp Jordan. The northern trail system will run parallel to the existing riverwalk, connecting to the south end of the waterway at two points: the Walnut Street Bridge and at the C.B. Robinson Bridge toward the north end of the trail near the Hubert Fry Center. The project could be 10-20 years from completion, but initial planning is already underway. "Right now, there are a lot of things that are still up in the air," local resident Jim Johnson said. Johnson conceptualized much of the north and south ends of the project that are currently in the planning stages. In 2014, he applied for a Causeway grant — a local organization that awards grants to private citizens — and won. It was matched by the national Rails to Trails Conservancy. The plan was adopted by the city and is now being led by the Southeast Tennessee Development District. The first part of the project involved a feasibility study on the North Shore to North Chickamauga greenway, which incorporates trails along active rail lines and was completed last year. Initially, the greenway would be a combination of quiet roads and marked bike lanes. Eventually, planners will transition the greenway to paved multi-use trails along rail corridors. From there, the focus would turn to connecting the newest St. Elmo section to Camp Jordan via an extended loop through North Georgia and the Chickamauga Battlefield. The so-called ChickChatt Greenway would extend the current system from 25 miles to a 55-mile, continuous-path loop for cyclists and pedestrians. Johnson believes the network could have an impact similar to the one seen from the Silver Comet Trail — 61.5 miles beginning north of Atlanta and extending to the Alabama state line. A 2013 study by the Northwest Georgia Regional Planning Commission found that every dollar invested in trails creates at least three dollars of return from tourism and recreation-related activities. The study found the trail's users directly generated $57 million for area businesses. "The concept of ChickChatt is connectivity," Johnson said. "It would be an asset to our residents as well as becoming an economic driver."